Ninth edition of Mountain Echoes Lit Fest to celebrate 50 years of India-Bhutan ties. The three-day festival will celebrate untouched beauty, unexplored ideas and unstoppable voices from the heart of the Himalayas and focus on subjects like spirituality, philosophy, performing art. 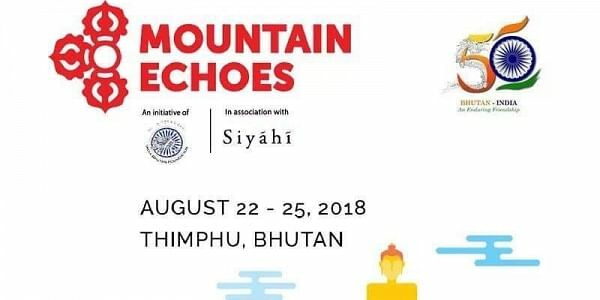 NEW DELHI: The annual Mountain Echoes literary festival, in its ninth edition, will celebrate 50 years of diplomatic relations between India and Bhutan. An initiative of the India-Bhutan Foundation and Indian literary agency, Siyahi, the festival that begins on August 23 in Thimphu, will pay tribute to the rich cultural ties between the two nations. The three-day festival will celebrate untouched beauty, unexplored ideas and unstoppable voices from the heart of the Himalayas, and focus on subjects like spirituality and philosophy, performing arts, environmental conservation, food, as well as film and theatre, among others. The inaugural session will see General V Namgyel, Bhutan's ambassador to India and Jaideep Sarkar, India's Ambassador to Bhutan, in conversation with Dasho Chewang Rinzin, Deputy Chamberlain to his Majesty the King of Bhutan Jigme Khesar Namgyel Wangchuck, leading a discourse on 50 years of friendship between India and Bhutan. The festival will also see sessions by Andrew Quintman, a scholar of Buddhism in Tibet, authors and environmentalists Daniel C Taylor and Dave Goulson, celebrated spoken word poet Sarah Kay, renowned Indian singer Usha Uthup, and Indian actors and theatre veterans Naseeruddin Shah and Ratna Pathak Shah. Other prominent speakers will include Nilanjana Roy, author of 'The Wildings', Kunzang Choden, Bhutan's first woman writer to write an English novel, L Somi Roy, author of 'Binodini - A Photographic Memoir', Chador Wangmo, author of various illustrated children's books, Kezang Dorji, one of Bhutan's most loved rappers, Dechen Roder, director of "Honeygiver Among the Dogs", and actress Tandin Bidha. "Mountain Echoes, the Bhutan Literary Festival, is an exuberant celebration of cultural connectivities, resonating with the joys of books and cinema, the shared narratives of music and folklore, food and sport, as well as deep spiritual perspectives, and the challenges of our changing world. "This year, we also have a special and important focus honoring the strong ties between India and Bhutan in their 50th year of diplomatic relations," Namita Gokhale, founder and co-director of the festival, said. This year the festival will combine the breathtaking locales of Bhutan with its cultural prowess. "The niche festival will spark the imagination of both local and global audiences through a diverse range of electrifying conversations," said Tshering Tashi, eminent Bhutanese author and festival co-director. The festival will also explore global and locally relevant subjects related to natural history, travel and poetry, including a tribute to 50 years of the Beatles in India, amongst others. It will come to a close on August 25.